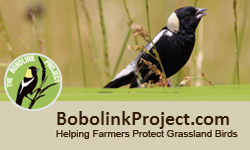 "I donated to the Bobolink Project because I feel it is important to protect our natural world - plants, animals, birds. This project is a way to help keep our farmers on their lands and their lands open to all life." "Until a few years ago we enjoyed bobolinks nesting in the fields near our home in Williston. Then they disappeared (even though the fields are not cut until August). They are beautiful birds, with a happy, bubbly song; I like helping to restore them to our area and state by supporting the Bobolink project."